The Smithsonian's National Zoo is on a 24-hour panda pregnancy watch as it tries to determine if Mei Xiang is expecting. Zookeepers say she's spending more time in her den, is sensitive to noise and is shredding bamboo for a nest, which are signs she may be pregnant. But those could also be signs of a false pregnancy, which also causes her hormone levels to rise. Earlier this month, the zoo closed part of its panda house around her den to give her a quiet space. A Chinese panda expert performed artificial inseminations on Mei Xiang on March 30 after she failed to breed naturally with male panda Tian Tian. 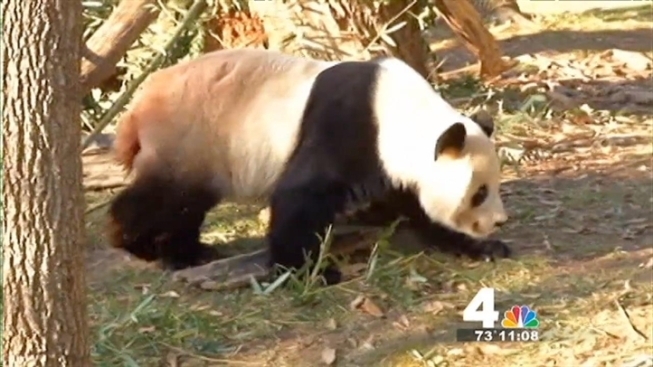 The Smithsonian's National Zoo is back on a 24-hour panda pregnancy watch, as zookeepers try to determine if Mei Xiang is expecting or experiencing a false pregnancy. Veterinarians say they won't know much until they can perform an ultrasound or she actually gives birth. Last year, Mei Xiang gave birth to a female cub. Unfortunately, it died 6 days later.